Mix the dry ingredients: flour, sugar, cocoa, orange peel, cinnamon and cloves. In another bowl, beat with the whisk oil and vinegar until blended. Add the mixture to the dry ingredients and mix well. Add the water, stirring until a homogeneous paste. Add the toasted and ground almonds, raisins, plums cut into strips and ginger and as final ingredient yeast. Put the dough into a cake tin greased and floured and bake at 180° C for 30-40 minutes. 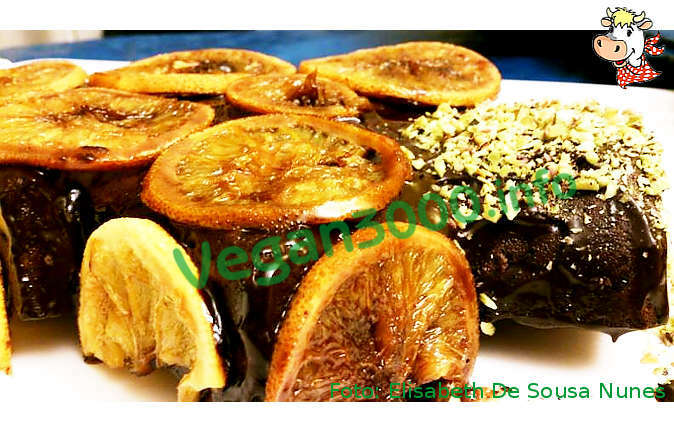 If you want you can cover with a dark chocolate frosting and decorate with candied orange slices.